In my opinion, there’s no doubt that supporting your methylation cycle can make a major difference in certain chronic illnesses. Just check out this medical journal in the American Journal of Human Genetics from the year 2000. It describes the methylation cycle pretty well – before so-called alternative medicine started talking about it. 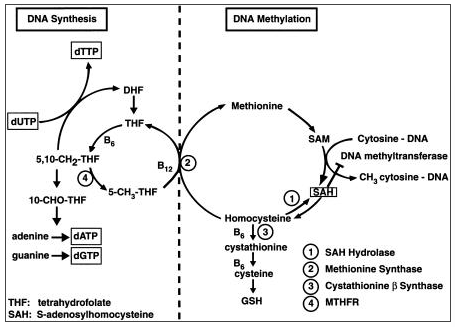 Just check out their Methylation Cycle diagram (Figure 1). Look familiar? I thought so. We’ve actually been in the process of rediscovery the last few years, and in my opinion, it won’t be too long before mainstream medicine eventually catches on. In fact, they already are catching up with prescription supplements such as MetanX, Cerefolin NAC, and Deplin. The problem is, most doctors don’t take the time to understand the biochemistry that takes place when prescribing these. I don’t think the pharmaceutical companies necessarily know what they are doing when they create these formulations either, but that’s another story. Buckle your seatbelts as mainstream medicine starts making an entrance. Just over the past few months, there have been an influx of studies about methylation and vitamin status (such as B12, Folate, and B6). The ‘golden age’ of DNA methylation in neurodegenerative diseases. Association of dietary and genetic factors related to one-carbon metabolism with global methylation level of leukocyte DNA. Arsenic exposure and DNA methylation among elderly men. Pretreatment dietary intake is associated with tumor suppressor DNA methylation in head and neck squamous cell carcinomas. Maternal intake of methyl-donor nutrients and child cognition at 3 years of age. In the last study I mentioned in the list above, the mothers were given folate, vitamin B12, choline, betaine and methionine during the first and second trimesters of pregnancy. And guess what? Results of this study suggest that higher intake of folate in early pregnancy is associated with higher scores on the PPVT-III, a test of receptive language that predicts overall intelligence, at age 3 years. So where are these studies coming from? The last one I mentioned came from the Department of Epidemiology, University of Michigan School of Public Health. Some of those other studies came from Harvard and National Cancer Center Research Institute, Tokyo, Japan. Just like us, these studies are looking at genes such as MTHFR, MTRR, MTR, and more. It’s a bit moronic that Bloomberg.com called these genetic panels and treatment “health fraud” when institutes such as Harvard and the Japan National Cancer Research Institute are looking at the very same genes, and using the very same vitamins for therapy in diseases as severe as cancer. Yes, these panels are marketed mainly for the Autism community. And no, they are not covered by the insurance. Some of the SNPs don’t have much peer-reviewed evidence to support the claims that are made. But it’s important to remember that treating physicians often rely clinical evidence as well as published research. So is supporting your methylation cycle a cure-all? No. Will anybody be cured? Cure is a strong word, but I think it’s possible that many could go into remission eventually. But even if it doesn’t cure or lead to remission, it doesn’t mean it’s not a worthy treatment. Does HAART cure AIDS? Nope. Does Interferon Therapy cure Hepatitis C? Nope. Do immunosuppressive drugs or IVIG cure Lupus? That would be another no. We must remember even if a treatment doesn’t cure, it doesn’t mean it doesn’t work. I am glad that research is advancing in this field, but I am sick of the fights between alternative medicine and mainstream medicine – especially when both are on the same page looking at the same exact things! But until physicians understand the complexity and importance of supporting the methylation cycle, it’s not likely your average doctor will embrace these type of tests and therapies. and fatigue, half conscious that it is just the kind of thing deserving of skepticism. But when I experienced strong adverse reactions to small doses of methyl folate and b12 that confirmed to me there must be something in it. Having said that, it seems to me that expensive and unreliable tests were a waste of money. I have a Biology degree, a Nursing degree, and I am becoming a Nutritional Therapy Practitioner. I have been studying holistic nutrition and healing diets for many years. I am fed-up with the arrogance of mainstream doctors and their lack of effective treatment for chronic disease. I have recently been learning about MTHFR and the nutrigenetics field. I am very, very grateful that you have decided to put your knowledge and expertise to work and create the geneticgenie service. I am in the process of getting results for my entire family. Thank You. Stop lying to yourselves, that’s the “cure”. Eat whole, natural foods, don’t put toxins into your body (processed foods, makeup, alcohol, man made chemicals like nicotine, etc, etc, etc…), exercise, and don’t use food as a drug but instead what it is intended to be, fuel. You know what you are doing that is unhealthy, so learn to listen to and honor yourself and you will find that your body will heal and take care of itself. Argue with this and you are in denial. You are absolutely right. Diet is the way to go for preventitive health. It can be the way to go to get well too. However, with certain chronic illnesses, you can have deficiencies or functional deficiencies B vitamins that aid in methylation. This can be see with tests such as b12, folate, homocysteine methylmalonic acid. 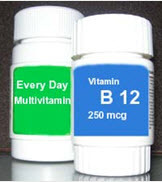 Diet can help homocysteine levels, and adequate intake of B12 can of course help B12 levels and methylmalonic acid. However, with seemingly enough B12 and folate, it can be observed that glutathione doesn’t come up in these patients. With other tests it can be determined that many of these people have a tremendous amount of oxidative stress – so it’s no wonder that their glutathione is low. While diet, lifestyle changes, and stress reduction techniques can do things like lower oxidative stress, boost glutathione, and help the immune system – for the patients with this tremendous amount of oxidative stress, diet alone is simply not sufficient. Furthermore, many that remain sick are on very healthy diets and avoiding allergens such as gluten, dairy, wheat, soy, etc. There is also evidence that in Autism, there is a high prevalence of cerebral folate receptor autoantibodies. While this can be partially addressed with dietary techniques such as avoiding milk (which reduces autoantibodies), the administration of folinic acid may be necessary. I wonder if this may be the some with ME/CFS since many seem to be very sensitive to folates, but there hasn’t been a study. And micronutrient therapy isn’t to be used in place of diet (nobody said that), but as an adjunct to diet. Diet, exercise, and lifestyle modifications are the best choice for family members that may also have significant reduction in MTHFR enzyme activity. I guess you could call me a reductionist if I said that supporting your methylation cycle would get you better – but I guess it could if it were your primary or remaining issue. But more often than not, other things need to be addressed that cause or contribute to oxidative stress. Anything from intestinal permeability, dysbiosis and bacterial overgrowth (which can be difficult to impossible to fix with diet alone by the way), chronic bacterial and viral infections, and avoidance of allergens or symptom triggers including certain foods, chemicals, pollen, dust, mold, etc. I’ve met many who have got significantly better or in remission where mold was a primary factor of their illness. Diet may have worked for you, and that’s great. However, there are many who have gone on very strict diets and just end up very frustrated. You can’t say these people are lazy and aren’t trying. There are people who do juicing and just end up feeling sicker. And diet is a confusing subject as well, because some think becoming vegan is healthy when in fact they are often starving their body from essential methylating nutrients (such as B12 and others). So if you are going to recommend diet changes, it’s important to specify what type of diet you are talking about. Thank you for your post. I have also been researching MTHFR at length because mainstream doctors don’t know anything about it. I am not as optimistic as you are that they will soon, but I am hopeful. Regarding cures, I personally have been “cured” of about five problematic conditions including vitililigo, IBS, depression and am looking forward to a reduction in fibrocytic breast problems but won’t know until next year; hopefully I won’t have to have any special imaging or biopsies. Cures aren’t actually where the beauty of this simple treatment for the defect lies. It’s in prevention. I have read study after study that includes MTHFR SNPs in it and the results have to do with folate status. So if the MTHFR person isn’t taking some form of folate (MTHF), then they are at much higher risk for many many conditions. I’m have probably the highest risk for breast cancer as anyone, but I’ve changed my folate status, and while my odds ratio before was 5 times higher than a non-MTHFR person, I can pretty much rest assured that I am now not going to get breast cancer as long as I maintain my folate status. My husband was diagnosed with Alzheimers and I can’t wait for his next neurological appointment because I’ll bet he gets undiagnosed. He has had memory problems and been absent minded for years, and now, at 75, he has improved immensely. Today, he was commenting on the price of gas at several different stations. (he is heterozygous 1298/677). My son has anxiety and depression (hetero 1298), and Aspergers (98% of autistic spectrum patients have an MTHFR SNP), and he is improving. So all you naysayers, continue to stick your head in the mud. I’m going to live a long and healthy life without cancer, dementia, and arthritis by maintaining my folate status. Thanks genetic genie! Have you by chance shared your story in more detail elsewhere? I’m also dealing with a number of the conditions you indicated you had including vitiligo, IBS, fatigue and anxiety. I’ve recently realized I have methylation issues and am waiting on MTHFR tests. I you’re willing to share what pieces of your treatment plan you feel were most useful that would so helpful for people like me who are just beginning on this piece of the puzzle. Was there a specific protocol you followed? I am working with an ND, but love to do my own research as well. After my first miscarriage we found out that we were toxic with heavy metals and went through chelation. We also found out that I was hetero for 1298 and my husband was compound hetero, and started taking methyl folate 2 mg + TMG 4 gm daily. After several more early miscarriages, we moved on to donor eggs. We were very happy to finally be pregnant and everything was going smoothly. Unfortunately I was 13 weeks pregnant when my baby was diagnosed with acrania (severe NTD). On my doctor’s advice, both my husband and I have increased our folate intake to 5 mg / day. However I believe there has to be more to this than simply taking ‘more folate’. I have read various reports on the web about improving methylation / homocysteine with a lengthy protocol of vitamins. I’ve also read elsewhere about the PONTI study for women given inositol + folate. Really, the more I read, the more complex the story is. But I’m going to to take everything I can to avoid going through another NTD pregnancy. Methylation issues have struck me in spite of healthy diet and exercise. After getting my genetic results I now know that no matter how much sun tanning and D3 supplementation I will not get my levels above 70. And the Methylated B supplement I have been taking is probably not adequate either but there is a new prescription only vitamin named Deplin that probably will. To add further to this discussion, my friend’s aunt is undergoing ECT since none of the anti-depression and anti-anxiety drugs she is taking are helping her depression. Her genetic results indicated she has two defective MTHFR genes. She is on now on Deplin also but still clinically depressed. All of this is for real, not a new alternative therapy fad, but the mainstream doctors are slow to accept “new” facts. Fortunately for her, she found a young, knowledgeable psychiatrist. I asked my doc to include a Homocysteine test on my routine exam. He wanted to know why. Then he wanted to give me statins when it was dangerously high. I incorporated a folate in lieu of a portion of my b12 and he just doesn’t get it when I went from 20 to 15. I increased the folate a bit again and am getting the 23andme process under way. They just don’t get it! Help please?? I did the 23andMe; ancestral data interesting, but Raw Genetic Data….whew? What next please, any advice? There are 10′s of 100′s of pages of genetic info. You’re all referring to hetero? Mutations, MTHFR, markers: Where does one go to have this info interpreted please? Hi, after reading this remarkable post i am as well happy to share my experience here with colleagues. I just ran my raw DNA from 23andme through a service that breaks down the results for health and explains it. It confirmed that I have the variant for MTHFR. I had been to doctor after doctor for alarming symptoms such as shortness of breath and disappearing joints and cartilage. I’ve had three spine surgeries and a hip replacement. After having some tests that were abnormal on a permanent basis, such as high RDW and a test that revealed high homocysteine levels, I went to my doctor and asked for the B12. I had to figure this out on my own. He prescribed the L-methylfolate to go with the methylcobalamin and I also inject B-complex from the feed store (with everyone’s knowledge! I learned about it on a bodybuilding forum). When I had the first tiny injection of the B-complex, it felt like my brain lit up. Also, the shortness of breath that I had been experiencing for years went away with the B12. I had been to doctors who treated me for asthma and COPD, but the B12 cleared it right up. The sublingual doesn’t work very well. I had to take about 10 before I felt better. Insurance doesn’t cover any of the vitamins, but compounded methylcobalamin is not very expensive and there are more souces now for the L-methylfolate. The very first prescription was $400! Now, it is $30 a month for the equivalent from a supplements company. I just hope it is the same as the generic Deplin. I also had hypothyroid and take 50mcg of Synthroid which I get from Canada. My great grandmother died from pernicious anemia. This seems like the same deficiency to me pernicious anemia is from B deficiency. It was certainly killing me slowly! I feel 100% better now and have even started taking classes again. My mind is fully functioning with no brain fog like before. This article is an utter misunderstanding about the methylation cycle and research into beneficial supplements. Yes, the methylation cycle exists. Yes, in certain situations, particularly low B vitamin intake and high nutrient demand — as in pregnancy — supplementation of vitamins that coincidentally support the methylation cycle can be beneficial. This is true in any situation of poor nutrition, which is endemic in the modern diet with its scarcity of fresh vegetables. However, this does not demonstrate the value of genetic testing to address “treatment” of the methylation cycle. Even Ben Lynch will admit “treatment” is basically trial and error. What will “work” cannot be predicted, even with genetic testing in hand. You keep trying various supplements until you feel better. What it is that makes you feel better can be due to any number of things, not the least addressing a micronutrient deficiency or the placebo effect. In fact, Ben Lynch recently told Chris Kresser that the best way to “treat” MTHFR variations (which, after all are NORMAL variations) is to eat lots of leafy green vegetables! Basically, eating leafy greens is good for everybody. You don’t need a genetic test to tell you to eat your greens. I have an endocrinologist who is deeply versed in all aspects of nutrition, genetics and nutrition. I was tested for MTHFR before seeing him and have the mutation. He said that MTHFR is a normal variation of the gene and over 40% of population have it. It must be treated only if your RBC folate is low or your homocystein is elevated (he uses 10.4 as cutoff). He also looks at B12 level and MCV (size of the red clles= cutoff 93). If homocystein is under 10.4, MCV normal and RBC folate is normal, the mutation does not mean anything and you cannot blame Hashimoto’s, or arthritis or other auto-immune diseases on MTHFR. He told me that taking folic acid pills without needing it is a big risk factor for colon cancer and other cancers since cancer DNA uses it for growth. You cannot play with your own body. 99.999% of doctors have no clue about this. I am luycky to have a doctor who knows both sides of the equation (= conventional and non-conventional medicine). He does not think there is conventional or non-conventional medicine , he always tells me that conventional doctors got lazy and functional doctors clung to a little bit science but build a castle of non-truth around it. Folic acid is good only as food not pills. Google folic acid and colon cancer. you will see what a big risk factor it is if you take pills and you do not have the disease. Folic acid is synthetic. In nature, such as leafy green, there is folate. Folic acid is man-made. That is why folic acid tablets causes cancer in people who take things randomly based ob pseudo-scientific blogs. My doctor’s name is Shirwan Mirza, MD. I found him through his facebook on chronic fatigue syndrome. The author was not using the word folic acid as a suggestion. But “Folate.” The original, broken down form. And it can be taken by pill (formulations are becoming more accurate). I prefer getting them by whole – food, organic produce (which you can get them, even if challenging). But I also agree with the author…as many are and have been adjusting and improving their diet tremendously and learning what substances trigger their symptoms…and still need supplementation (because their biological systems have been living in such a highly dysfunctional state for so long that too much damage has been done or the amount of mutations that ARE expressing are many and complicating the treatment of/exacerbating/compounding each other). Food is becoming less nutritious so we are possibly not consuming as much nutrients as we once thought. So getting those needed vitamins solely from vegetables may no longer be realistic. I eat healthy af but I still have ibs attacks daily. I’ve gotten to the point that I’m eating everything in soup form because I’m exhausted from being in pain everyday. No baked goods, no restaurant food, no dairy, no grains. Everything is organic and made from scratch. I usually puree kale, carrots, cauliflower and mix it with my homemade chicken stock because my body can’t handle intact vegetables for more than a week. It really annoys me when people say to just “eat your greens” or “just eat healthy” and you’ll be fine. It’s actually more than annoying, it’s ignorant. Couldn’t find any info on MTHFR testing and when I did a search on 23andMe this is what I found. Where can I get the MTHFR testing? Thanks!! While 23andMe says they do not support MTHFR analysis, you can still get this information from them. Once you have your gene sequenced, you can download your raw data and use it however you would like. On this website, you can upload your data and use the methylation analysis to determine your mutations of MTHFR and other important genes.